Two illustrations of Bach y Rita’s vision substitution system, in 1969. “Four hundred solenoid stimulators are arranged in a twenty x twenty array built into a dental chair. The stimulators, spaced 12 mm apart, have 1 mm diameter “Teflon” tips which vibrate against the skin of the back (Fig. 1). 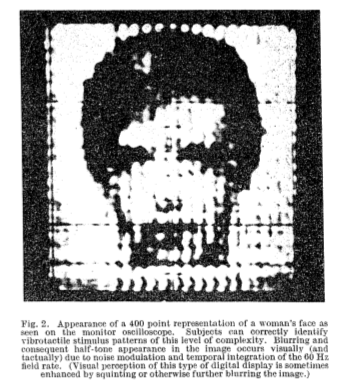 Their on-off activity can be monitored visually on an oscilloscope as a two-dimensional pictorial display (Fig. 2). 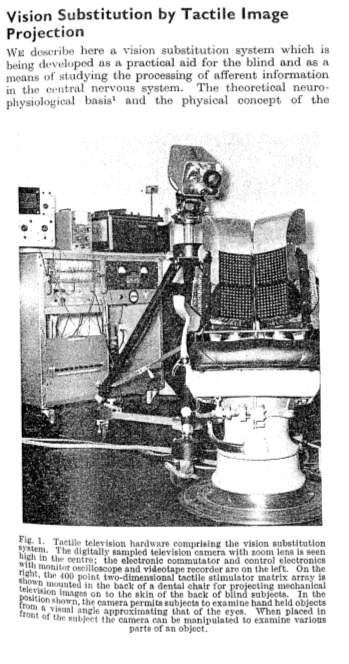 The subject manipulates a television camera mounted on a tripod, which scans objects placed on a table in front of him. Stimuli can also be presented on a back-lit screen by slide or motion picture projection. The subject can aim the camera, equipped with a zoom lens, at different parts of the room, locating and identifying objects or persons. This article was posted in Vision and tagged analog, blindness, brain, extension, eye, image, mental image, nervous system, object recognition, retina, zoom. Bookmark the permalink. Follow comments with the RSS feed for this post.Post a Comment or leave a trackback: Trackback URL.